I first learned about Max Wallack from a Google alert I received. At age 12, Max received a 2009 Huggable Heroes Award. Max donated his $2500 award to the Boston University School of Medicine’s Alzheimer's Disease Center. That caught my attention. Subsequently, I wrote an article entitled, Who is Max Wallack? I learned that Max also won a $10,000 award from the Intel Foundation for his invention called the Home Dome. This was one of many awards that Max won by the age of 12. Max has added a long list of awards to his resume over the last 3 years including a Nestlé Very Best in Youth Award. He is also a Davidson Young Scholar. At the end of 2009, I asked Max to write for the Alzheimer's Reading Room. He agreed. Among a long list of articles Max wrote: An Escape from Alzheimer's, Great Grams, and "I Remember Better When I Paint". If you want to read more about Max, and more of his articles enter Max Wallack into the search box on the right hand side of this webpage. Today Max is being featured in MSN Causes, 16 Kids Who are Saving the World. 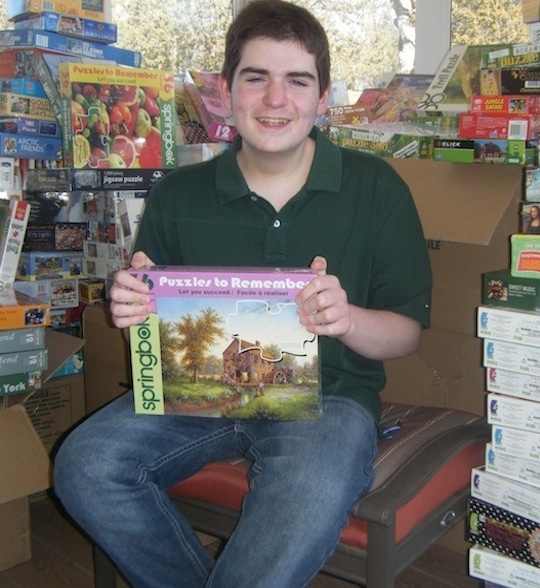 To donate to Puzzles to Remember go here.